I have recently bought myself some edible inks to have a play with during my cake decorating escapade’s. As you’ve probably noticed from my previous cake decorating attempts, I’m not the best but I do try hard. They’re my birthday cards in the background. The main ideas for using the inks are to airbrush template designs onto cakes or cookies or to use rubber stamps to stamp images on. I used to make cards so I have some supplies in the loft which will help me do this but I will write a post about it one day when I get round to doing it. Today I wanted to try painting with the inks – its a lot harder than it looks. The inks are very watery (although the colours are good) I suppose closest to watercolour paints, the icing is nonporous so the colours sit on and don’t soak in and you cannot apply any pressure because wet icing is soft icing. That aside I made a kinda cute little teapot and cup and saucer which I painted, rather crudely with flowers. 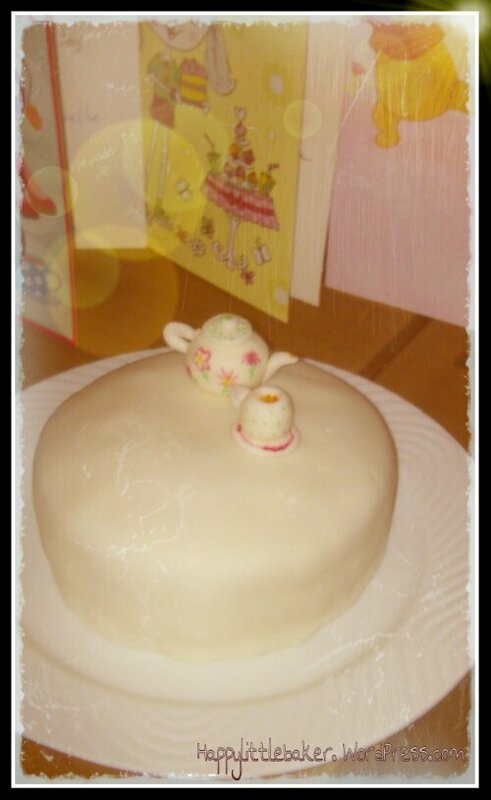 I think by the end I was getting the hang of it and I know I said it before but I could really do with a cake turntable. I made a teeny little sponge cake and decorated it with icing…then I gave the cake to my parents. That’s really cute! Great effort 🙂 Must have taken a while.